“The localization operation of the default folders of mailbox failed:Cannot localize the default folders.” the basics. This post actually dates from November 3, 2015. I have made such adjustments that I have re-published the post. The message does not really have a clear error message what is going wrong, besides that it cannot localize the default folders. A colleague of mine got this error message and after searching for a time we found out that this has to do with the default language settings. This is because you try to change a folder name to a name that does not match the default language. For example, it may happen that a user imports folders from a .pst file that correspond to the default folder names. 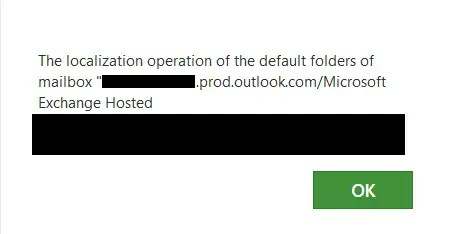 As a result, Outlook cannot localize the local default folders aka “failed:Cannot localize the default folders“. Below I have two solutions. If you are a system administrator and have access to the Office 365 environment and know how powerShell works, you can try option one. If you are an end user, you can go directly to option two. Option 1 – The Sysadmin solution for “Cannot localize the default folders”. As I mentioned above, you can only use option one if you have access to the Office 365 environment, and know how to log in to Exchange Online via PowerShell. I can give you that second part, but for the rest you have to do it yourself. Make sure you have installed the Exchange Online PowerShell module. See if that has solved your problem and otherwise continue with option 2. Option 2 – Lets fix it as an end user. Log on to Outlook Web App by using your credential. Click Settings, and then click Regional. On the Regional Settings page, change the language, select the date and time format that you want to use, and then select the Rename default folders so their names match the specified language option. Click Save, and then exit Outlook Web App. Default folders which may cause that conflict are: Inbox, Sent Items, Drafts, Junk Email, RSS Subscriptions and Deleted Items. If you have found another solution, can you indicate this below? I’ll adjust the blog post and I’ll tag your social media if you want. Do you have other feedback or ideas? Then you can also let me know below.